When you put the Eye Defense Fortifying Serum on your fingertips, the first thing you do is you smell it. And I can tell you; it doesn’t smell nice. It smells like those cheap perfumes someone gave on your birthday, which eventually ends up as a toilet refresher. But to be honest with you, I couldn’t care less about the smell if it actually did something good for the eye-area. H2O Plus claims that your dark circles under de eye area will get less. Well, that’s not a total lie, because one friend of mine did get swollen dark circles. So you can’t say it didn’t do anything. Another thing is that it’s just way to thick and greasy for an eye serum. After 10 minutes the “serum” was still visible under my eyes! It contains methylisothiazolinone, which is not a good ingredient without washing it out. It could do great in a wash out product like shampoo maybe. By the way, I really love H20+ shampoos. Then there is the price $ 38 for 0.5 fl oz / 15 mL. We think is no good value for your money. We stick with using cucumber slices…. 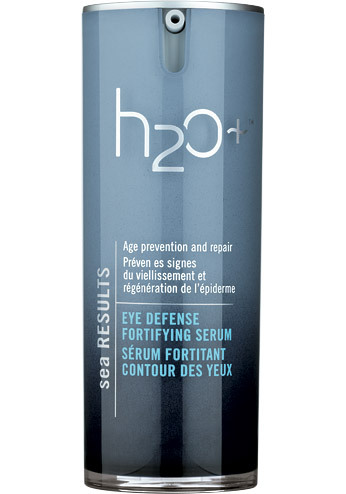 NOTE: We have tested the H2O Plus Sea Results Eye Defense Fortifying Serum on 2 woman, less than normal.